"Great tool for engaging wirh live users on the website"
We really like Olark because it has all the needed functionalities to chat with customers and to engage with them thereby increasing sales. The real time notification system and user behavior analytics are really awesome to use. Also there is a report that can be downloaded weekly showing the user data and their analytics in all formats like excel and PDF. We also like the new feature of adding more agents so that the work can be shared to different agents. Their pricing plans are too high and cannot be afforded for small companies. Please reduce the plans so that everyone can benefit. Also please consider making a startup plans so that more companies will began to use this product. Please consider making a pricing plan for small companies so that you can get more customers. We have integrated Olark into our eCommerce site and we are really happy with the increase in customer engagement using Olark. "The easiest way to keep up with customers in real-time." The instant notifications and simple design help me stay in touch with clients; answering questions, communications and sales are made easier with a platform I can rely on. I can assist clients in real-time while they are browsing my site and keep track of the specific items they are requesting. There is very little to improve on but I do have a few suggestions: It would be great to have this platform linked with my commerce platform so that payments can be handled within the chat. I also think that the popup chat bar could be more discreet but that is only a minor issue. Overall I am quite pleased with this product. It hasn't failed me yet. If you're looking for easy to use software that will help you stay in touch with clients and never miss a business opportunity then this is the product for you. As an independent artist, I am responsible for every part of my sales, presentation, customer service, and outreach. I can easily communicate with my clients and receive direct messages about interest in a piece or commission requests. The ability to send automated messages to peak my customer's interest and inform them of updates to my website is also a huge benefit. "Providing outstanding customer service utilizing Olark." My ability and my customer's ability to chat with a live person on the spot with an extremely short response time as well as their ability to recognize exactly who I am when I chat. Olark's internal caching feature shuts my chat off sometimes and it is a difficult process to get it up again. It does seem to have gotten much better in the last few weeks, however. There is not a screen share feature. Pretty stable platform. Good reliability. Very easy to use. Would like to see a screen share feature added. Immediate support for our customers. Customers are happy because they get an answer or feedback or a referral to a trainer or specialist right away. No wait time. It is a great program, with lots to offer, and from what I have seen, the company is amazing to it's employees, which can effect the clients, since you can often tell based on customer service experiences. It allows us to keep track of all of our chats, as well as allows the guests to grade their experience. Plus it has generated a ton of new leads for us! The only feature I wish existed was a way to put a chat on hold, or allow them to put their info in and let them know that someone will be with them momentarily, instead of getting multiple chats at once. We often have to all be offline to finish what we are doing, which doesn't allow the clients to use the chat feature. It would be useful for those companies, like us, the only usually have 2-4 people online at one time. Make sure you will have enough staff to man it, in case you are getting a large influx of chats. It can be hard to handle 3 or more at one time. It helps us catch those guests who don't want to call in and talk to someone real. We are able to give our information at the click of a button, and then eventually get more leads out of it. We require at least their email address, so they also get put into our mailing system, which also helps to generate leads. "Excellent Tool. Will Generate Revenue if Using in Sales Environment." It's a simple tool and it lets us interact with customers at a very important step in the buying process. The filtering and customization lets us adapt it to our site nicely. Reporting lets us measure employee performance. I can't think of something I dislike. The tool is very useful. If I could make it better I might consider integrating it into other services like gmail or hubspot to manage everything in one place. Use the trial if they offer it and test it out for a few days during business hours. Then test it out outside of business hours to see if you are missing opportunities in your normal way of doing business. Configure the chat box extensively and test out different messages/attention grabbers. Customer communication is key for us. The conversion increases if we have an opportunity to speak with them. Customers are liking not having to talk with someone on the phone. It also lets us see traffic and when and where customers are shopping on the site. It gives us a great amount of insight. "Olark is a great tool!" Love how simple it is to adjust settings for the chat, seems to be very easy for the users to use as well which is very important (we've used other chat platforms before where costumers felt lost and ended up just calling). I wish it had more design options, the look is great but it would be cool to be able to implement more design elements and import our own assets to fully customize it. Never be afraid to reach out to their customer support, I've had countless of questions that have been resolved almost instantly through their chat, they always go out of their way to make sure you have resolved any issues you were having with their product. Costumer retention, it has helped greatly to be able to attend to our costumer's needs in real time while they're navigating through our website rather than them having to figure things out on their own and hesitate to give us a call or send an email due to urgency. I like how easy this was to install on my site. The analytics are great - especially the integration with Google Analytics. I like several of the extensions and the possibility of integrating chat with other applications. I like that they have free trial. The chat interface and its behavior are customizable to match our site's look and feel and business workflow. You can define the number of users and get billed based on the actual number of users. You can go up and down on the number of of users depending on your needs. Olark's customer service is helpful and responsive. This product affects page load speed (which slows down my site, although it's true of many website add ons). I wish the pricing was more affordable with larger number of users. I'd like to see more integrations with CRM's - especially with Zoho CRM. Pulling up transcripts is a little slow, but fortunately we don't need to do this very often. Look for integrations with your CRM. Helps conversion of website visitors to better sales leads. We are able to track conversions on Google Analytics which is quite helpful for optimizing our pages and even digital advertising. It's also works well when an agent isn't available to respond by taking a message via the chat window. It will send an email to us when someone wants to chat (and there is nobody available to take the call). "YoY Chat Bot Great for Tracking Trends"
Olark makes the conversation with the customer effortless and easy. With a polite bubble ping, the employee is not only notified of incoming messages but also able to reach out to existing users that have yet to reach out. You can push the customer to certain pages as well as allow them to share their screen with you. Simple commands using a "!" at the beginning allow for automated responses created by the admin. Transcripts easily upload into customer management platforms such as SalesForce to allow for documentation practices to be upheld. Each chat offers an opportunity to review at the end. This can be monitored by the admin on the home page when the admin logs in. Low chat scores are easily identifiable. Should off-hours be present or they just barely miss an available agent, the chat is swiftly converted into an e-mail that requires follow-up by an agent. My preference would be for Olark to have its own built-in spell checking method. For example, if the agent had 1-2 typos, it would refrain from allowing them to click on send without fixing them. I would prefer that it would be advanced to check for incorrect use of words or grammatical errors. Although the normal computer program tracks this, I'd recommend installing an add-on to the web browser to ensure additional accuracy when managing a larger team. The notification integration is also poor as it can only be used in specific browsers. Desktop notifications need work. Make sure your team has awareness of the notifications - I have found it is often hard to hear/follow when using a phone system on the same pair of headphones. Olark made us available to our customers in as many forms as possible. For those that prefer online communication, it allows a safe and easy point of contact with freedom to speak without constraints that many chats give. You're speaking with a LIVE person - not a bot! Olark gives you the ability support your product via live chat. This is huge for our team as we get so many phone calls and emails from users about very small questions or requests that can be answered quickly. Phone calls and email are no where near as quick as live chat! Olark has an amazing interface and user experience. Olark also gives our team sufficient analytics on our users! Pretty awesome stuff. I would like the ability to have multiple paragraphs in a response to a client. The number of seats you can buy is a bit frustrating, as it doubles from 4 users to 8 users. We have 6 potential users and would be paying for 2 extra accounts. We choose to just make due with 4 users on live chat. From my experience, Olark is a top notch product from a top notch team. I highly recommend their chat feature. My goodness! Live chat has tremendously allowed for our team to cut the volume of phone calls that some in from our customers. It gives our customers a quick and reliable way to reach us. Hi Taylor - Thanks for the kind words about Olark! With regard to your comment about the number of agents you can purchase - we allow you to add and subtract users "a la carte" now, no more agent groups. So if you only need 6 agents - you only need to pay for 6 agents. You can add or subtract agents at any point in your billing cycle and your payments will adjust automatically. Pretty easy stuff! Olark is simple to use and fairly unobtrusive visually (and I know you can configure the look to fit your site's motifs). It's a lightweight widget that we use for customer support on our eCommerce website. I like that it's configurable so you can have both live chat and after hours messaging. I also love the way chat logs are archived for easy reference. We have a large customer service team across several offices and it meets our needs admirably. It has a ton of integrations possible, so if you're way into Slack or Hubspot or Salesforce or whatever, you should be able to plug Olark into any of those things. Frankly, my company isn't even using it for lead gen and we probably should be. We're Hubspot fans over here and we haven't even scratched the surface with Olark and Hubspot integrations. Honestly, I've never had any complaints about the service from either users on the site or our customer service team. Obviously chatbots are all the rage now and I don't know how well Olark integrates with those since we aren't using that yet. It does integrate with Hubspot (which should have some bot features soon) and a webhook API so it might work with a chatbot but you'll have to do your research on that. We only use it with live reps and it works great. "Easy setup, quick return on investment!" I like how easy Olark is to implement and how it makes our company much more accessible to potential clients and students. For just a small fee each month, we are able to capture more leads and help students register for our courses before they leave our sales page and get out of the purchasing mindset. Maybe this is just something that I need to look into on Olark's site, but I would like to have training on other features of the software and how to best communicate with customers on the platform. Answering questions that many potential students would not bother to email us. Truly, Olark is a standout amongst the best items that we've at any point utilized! In case you're searching for simple to utilize programming that will enable you to keep in contact with customers and never botch a business chance then this is the item for you. General client support from their PC or versatile programs. End clients can discuss straightforwardly with care staff to have a plenty of issues settled; including deals data. This service has completely changed how we interact with prospective clients. There is a feature that prompts a chat with the prospect after so many minutes and has proved to be a total game changer for us. Also - to start the chat, the prospect is required to enter in a bit of personal information which allows us to capture their info and market to them again. I do wish there was more customization available as far as the look goes. You also have to have a certain amount of users to be able to remove the Olark branding. Give it a try with the free version if you are unsure. The premium features are more than worth it as well... capturing contact info, receiving an email of the transcript, additional customizations, prompt chats. I believe anything you can do increase your engagement with your prospective clients is win. Olark support is great. The chat is also very easy to use on the consumer end. We are turning leads into prospective clients by engaging with them as soon as they visit our website. We are also able to capture their contact info and target market them once they leave the site. Our website leads have increased by ~80% just by adding the Olark chat feature. The cost is so low compared to the payout for us. Hi Danielle - Thanks for the review! Probably worth noting that now you can remove the Olark branding any time you want (There's a small upcharge to do so, but it's cheaper than reaching the required number of agents). "Olark makes it easy to chat with customers through our company website"
I like that people can easily ask me sales questions through our main website. This allows better ways to serve customers during the sales process. When I transfer a chat to another saleperson, there is a long process to see the history of the chat. The salesperson taking over the chat has to login again and click into history. It just takes too long when people are expecting quick responses. We're making it easier for clients and prospects to get in touch with us and reach out without feeling like we're going to spam them if they leave their email on our site. "Simple, easy to use, chat solution for a decent price"
I like how you can see the pages and activity of the visitor through the chat portal and the ability to tailor messages based on the page or activity. I also like how in the chat, it shows you the UTM params or referral source and also integrates with salesforce. Although Olark integrates with Pardot (which is great) it is a bit challenging to set up and doesn't always work. It can be especially challenging to integrate properly if you use chat for sales and support. This may not be a limitation on Olarks side, but if you use Pardot and need to push leads through to Saleforce, it can be a challenge. Do your research. Olark can be great, but make sure it meets all of your needs as there are plenty of options out there to compare. Great tool for sales to answer questions on pricing or reach out at crucial moments to convert more visitors into leads. It's a great tool for support as they can answer questions and get through more cases. "Olark a great tool for sales!" it is a great tool, is easy to setup and use, it has a lot of features, I like the integrations with other softwares like mailchimp,the reports are very helpful because it shows a lot of important data. I do not like that it cannot have an integration with a bot, I would like to have a bot integrated so I can have a frecuent questions database that the boot can answer before to call to an agent. It is a great tool for communications with customers and improve online sales, easy to use and easy to setup. We solve a problem in our web chat, must of the people do not like to register in a form, so we setup olark as our contact chat, and our sales were up inmediately. Our supervisor can set a limit of active chats. I'm my case, my supervisor sets a limit so we don't have more than 2 active chats at a time. I seem to have a glitch with this because sometimes I'll randomly have 4+ chats with customers waiting for a response from me. We are chatting with customers who can't call on the phone, but need a quicker response than email. Benefits realized: there is more connectivity with agents and customers. I like that it's in real-time, you can see what the guest is looking at, and the short cuts make chatting very easy. After 5 minutes if you have not responded to a chat it puts you away. Definitely recommend it for guests to be able to ask small questions without having to call. Or for you to be able to get a guest on the phone if they have more complicated questions. Since I am in sales, it helps us engage guests that would normally be surfing the web. I get commission only on calls over the phone, so I can disrupt their online booking by offering to answer questions over the phone. "Olark gets the job done but needs some work." - Olark is great for chatting prospects via instant messaging. - It is easy to log a chat into the CRM I use with a simple command. - Transcripts from previous conversations are accessible within the platform. - If a chat ends before using the command to log it into my CRM, you are unable to push the transcript into your notes easily. In order to log it at that point, you would have to copy and paste it into the CRM which just does not make any sense to me. - Olark's automatic log out feature is not very convenient. It logs you out after 5 mins of inactivity. - Olark allows me to communicate with customers easily and quickly. "Good basic live chat system"
The design is simple and easy to use, nice integrations with other products and services (like CloudApp and Slack), and easy customization. Great for most businesses and a way to test how effective a live chat feature could benefit your company website. Includes nice reports on how well your conversations with customers went and highlights areas of needed improvement. Olark customer support is great and super responsive. Lack of customization options and minimal changes can be made by a developers standpoint. "One size fits all" function does not work for every business. We have run into some bug issues with responsiveness and overall function, but hasn't completely disabled use. It would be nice to have a better "team" experience where Olark users can join the same chat and take over the discussion if needed. Transferring the chat doesn't work as well. A quicker and easier way for online customers to get questions answered and to voice concerns. Olark chat has easily boosted sales. We have recently launched a new website and had it not been for this live chat feature, we would not have been able to identify sales-impacting bugs in our site. "Olark is a great solution! " We needed a quick, easy to implement, chat feature for our website. This provided that and a lot more. We quickly integrated it to our CRM and now not only use it for basic service related issues from customers but also as a lead generator! I like this product as it is, I only wonder if I would get a better integration to by CRM if I used their paid service or chat features instead. Overall if you need a good solution for chat this is it! I would recommend this because it is quick to integrate to your website and also has a lot of other integration available for your CRM options. This will increase your visibility to the customer as well as generate business for you. Online customer chat function. Lead creation. 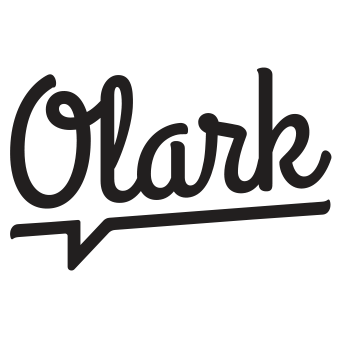 "Olark - the best chat system"
Olark is super easy to use and understand. My favorite extension is their shortcut feature. While chatting, you simply hit the semicolon key and all the available shortcuts will pop up. Their system is very modern and fun to use! They also have actions where you can transfer the chat to a different team member, block chatters, or tag a ticket to track issues! I wish there was a way for an agent to send attachments. This would be super helpful to provide the best and fastest feedback for the customer. Also, there needs to be a way to change the subject of the emails they send you for the offline messages. If you want a fun, easy to use and install system for your business, this is the best software you are going to find. Immediate answers for our customers is our goal. Olark gives a targeted chat, which allows you to set up rules to pop up for specific customers. They also offer an offline version. From here the customer can submit a question and you receive an email to respond to. You can personalize the chat as well. You can change the colors, fonts and add names and pictures of your clients. I noticed that when we added a name, people stopped assuming that it was a robot. Olark also integrated with Google Analytics. This is great to see conversion rates. There is a way to email the transcript to yourself or the customer directly from the chat. Olark also has surveys. These are in real-time and the customer is notified once the chat ends. This is great to see immediate feedback. "Olark works awesome most of the time "
It is very user friendly. Very bright and colorful. I love the shortcuts ability! I do not like that I can be logged out if I have not spoken to a customer within 5 minutes. If there was an additional notification sound or pop up that would be convenient. It's a great way to be able to reach out to customers passively on your website, and be able to answer any questions they may have! Confusion is a guests least favorite feeling, and will what make them go to another site. We are able to turn passive clicks on our websites and convert them to bookings. "Great customer service communication tool"
Olark makes is easy to manage communication through our website. We are able to receive and respond to messages with the page information attached letting us know what products/information the person was looking at in regards to their questions/comments. So far we have been happy with the experience with olark, I cannot think of a overly negative comment that can be added. The solution Olark has provided is for a third party messaging solution for our website. Not having to create/manage an in house system is beneficial for our needs. "Love the interface & API, but wish they had a desktop/phone app!" I like their easy to use back-end interface. It is easy to make changes, and they have excellent reporting. I also love the option to get notified if someone adds something to their cart. The API makes it easy to customize to your needs. I dislike that they do not have a desktop/phone app. I work with many tabs open, and it would be nice to have to have an Olark app on my toolbar. But this is not a deal breaker, I just created a favorites button to access Olark easily. If you need to remove the branding, it is quite pricey. It will cost you about $59.00 monthly. Olark gives us the ability to have a form on our website when we are offline. We find that customers are more likely to fill out the live chat form then send us an e-mail through our contact page. "Great way for instant chat on your wesbites"
Gives members a chance to ask questions as they browse their member site - so you can quickly help manage any concerns or answer questions. Transcripts that get sent after the chats are also helpful for record keeping and following up. It is a little difficult to add the specific teams (so that your team gets directed to the questions you can answer, and sales goes to sales, etc) to your website when you start the process. We needed tech team support and I wish it was just someone more intuitive to use the add-on. Definitely worth checking this out, seeing what this integrates with. There are many chat services on the market, so just research a handful and pick what works best for you. On-demand customer support. Gives an avenue for reporting any issues immediately so we can ID them and work more quickly to getting them solved. "Easy to use with great customisation options!" Clean looking, easy to use and understand even if you are just starting in Customer Support role where tools sometimes seem to be quite complicated. It easily integrates with your company's website or other frameworks. I also like that I get automatically signed out of it if I forget to do that. I haven't encountered anything so far that I dislike about it. Perhaps from the Operator side of things, expanding / adding navigation menu to get to the admin area of things would be useful. This is so far the best LiveChat support system that I've used so far. It's very affordable and if you are still unsure whether you'd like to pay for it, you can trial it for 14 days. Olark has a great community and support, so if you are experiencing any issue be sure you will receive assistance. They also have great help articles as well as Olarkacademy. Great solution for providing first contact Customer support. Support is excellent. Product is very stable and reliable. It is easy to use and service is very consistant. We have used this product over 1 year. Wish it had more features, but it is a growing company and I like their dedication. Would like a client assist feature. They used to have it, but are not offering it anymore. If you are looking for a consistant, stable program for live chat within your product or Website, Olark is a great product. The client services are excellent and our company has been very happy with OLark. We use O'Lark every day inlive chat of our product. I have not had many issues while using this product. Mostly minor and the team will take care of them quickly. We also use Olark on our website for people who are interested in our software. I love the way OLARK works so much that I use it everyday at work. I love that with OLARK I see the different metrics showing me how many chats I had and the ratings and so on. I can't really think of anything that I dislike about OLARK. I would highly recommend using OLARK for your business if you have the need for chatting with your customers or clients. The benefits of OLARK are simple...it helps me do my job of communicating with our customers very easily. Another benefit of using OLARK is the co-browsing feature which I use all the time, it's truly amazing! WOW, OLARK is the way to go for chatting software that will keep you up with all the lastest ways to interact with your customers. "Olark is great for connecting with customers "
What I like best is how with Olark I am able easily to connect with customers in real-time and see what they're seeing. Some customers don't want to call in and they might be multitasking so task offers another medium for our customers to connect with us and shared their issues and get answers in real-time. This is great as opposed to emailing us through our contact form- which often involves a lot of back and forth and wait time between each party's response. It takes on average 10 minutes to get a chat complete to resolve all their questions, whereas versus email we would have to sometimes take up to 24 hours to get an issue resolved with all the back and forth. I don't like how the link to that person's account doesn't automatically open. This means that I still have to manually pull up their account by searching by email in our system and this means more wait time for the client. Clients expect faster responses via chat and it would be nice if somehow Olark could be integrated with our CRM so that a customer's account can instantly pop up which would definitely create a WOW experience for clients as we are able to immediately look into the issue as opposed to searching for the account. Olark is easy to use and allows faster connection with customers in real-time. You're able to see when they're typing and what pages they're looking at which helps make a more WOW experience as you're able to more easily diagnose the issues. One of the main problems was response time. Previously we only had email channel where clients could write in. This meant a slow response time, and clients couldn't upload screenshots to their requests. This was a problem especially for our technical troubleshooting where a client was seeing something and we weren't sure what they were seeing and then they'd have to describe everything and then send us screenshots which further delayed the process. Plus, email led to a lot of back and forth which mean a longer response time to resolve their questions. With chat, they are now able to upload screenshots via Olark and we are able to answer all their questions while we're both available instead of waiting for the other party to reply by email. This has led to higher customer satisfaction. The simplicity of the UI used as an operator, and on the viewers side is minimal but effective. Sometimes Olark network may not be up but out of 1000 times logging in, this happens maybe 1 to 5 times. Not unreasonable. I also hope operator could send attachments. I also hope there could be a group chat feature for operators. Quick and fast website loading allows for maximal speed when logging in as operator. 10/10 there is no issues on the viewer side of chat, where operators are able to work fast with auto prompts and commanges. Olark has a wide array of functions that make it a very valuable live chat platform. Previously, we used LiveEngage by LivePerson, and were very disappointed with its integrations and functionality. With Olark, our sales staff is able to proactively engage website visitors, take them on guided tours of the website, hand off chats to other operators, and use web hooks to import data easily into our CRM (we use Velocify). Their support has been exceptional as well - and all at 1/4 the price we were paying for LiveEngage. My only complaint about Olark is that they still haven't figured a way around ad blockers. With increasingly aware internet users, ad blockers have become more prevalent. To have our live chat service be blocked for those users is disappointing. I'd hope that this is something they're actively working on, though they expressed little concern when I brought it up to them. Go for it. You're unlikely to find a better product for the money. High-traffic enterprise companies could potentially benefit from a more advanced software, but Olark solves all the basic needs for a SMB. Olark solved two major business problems for us - one being that it corrected the major flaws of our previous software by giving us a much wider array of functionality. The second was that it made it a lot easier to prove ROI from live-chats and justify the ongoing cost to executive management. Between its low price point and huge array of features, Olark is a great value. "Easy to get started, easy to use"
How easy everything is. Installation on the site is super quick as is setup and changes. Adding new team members is fast, as is monitoring conversations. If you have a small-ish team you want engaged on chat, you should 100% use this tool. If you have bigger teams (10+) then read other reviews because I haven't used the teams feature yet. But considering how easy everything else is on Olark, I would be surprised if teams is any different. Nothing. I really love this tool. If there's an improvement I would make, it's to make finding various settings a bit more intuitive. They aren't always where you'd expect to find them and there's no quick search to figure out it. It's not a drama though - just adds a couple clicks while you look for it. You should try it, especially if it's your first chat tool or if you don't like your current one. Olark is incredibly easy. We want to make sure we can answer customer questions as they have them. Olark helps us do that in real time. It helps us engage customers at the exact moment they are considering our product. Plenty of SPAM Bots can operate the form and get by, but that's not to big a deal. Customers and Clients reaching out to us when we are away from the website and during off-peak hours. Chat-to-Email works great and we can respond via email vs having to sign into the site to respond. Ease of setup was ideal since we needed a quick resolution when our previous platform would no longer work for us. I wish there were more reporting options and we have the ability to tag chats based on keywords and pages the client was on when speaking with an agent. However, they have added additional reporting features that are helpful. We needed a way to offer clients omni channel support while fitting in with our brand aesthetic. We have seen an increase in adoption with our clients which get them support faster using a preferred medium. All in all we are happy with the results. You can customize the chat box however you choose, colors, logos, text, etc. It now has a mobile option so people on their mobile phones can chat. Nothing at the moment. :) I started using this after a few products a few years ago and it seems to work very well. A great way to be present and check in with new website visitors. Trying to be available to potential clients when they want to chat with someone, maybe to ask a question, maybe just to get that warm and fuzzy feeling. "Great customer service chat program"
We have found no issues in using olark as of yet. Olark is great for smaller companies who have a lower budget for additional customer service oriented features like live chat and email automation. We have increased real time communication with our clients which has increased sales. What used to go to our inbox and have delayed response time is now addressed on a real time basis providing greater customer satisfaction. "A perfect tool to acquire and retain customer"
Consider a scenario where each company is competing to get new business and retain the existing one in online business domain. Business to be anything e-commerce, online customer support etc. ; Olark is the best live chat tool to provide smoother and happy experience for you customers. (1) Grabs customer's attention: It's UI catches the attention of your customers to get connect with your support team. (2) Behavioral/Sentimental Analysis: The behavior of customers is traced and could be used to analysis to know their sentiments. Although it is a very light tool but compatibility with applications designed on older technology is a challenge. Also due to high number of upgrades, the API changes frequently. So integration needs to be taken care of. It's a brilliant tool for all the companies in the online domain as it's beautiful and too easy to use for customers. Also it's one of the cost effective solution for interacting with the customers. For all the visitors on our company website and the existing customer support tool; we have integrated Olark. It provides the instant and fast conversation. It's so easy for customers to use that the existing raise their tickets/queries via Olark only. It's improving customer satisfaction and therefore, sales. "Olark is straight to the point. " We needed a live chat program and Olark gave us just that and at an affordable price too. I like the ui of this program, it is straight forward and easy to navigate. We didn't have to spend days training our staffs on how to use this tool. They picked it up themselves within a day. Olark doesn't yet have a mobile app. Thus our support team can't connect with customers on the move. It may not be the best help desk program out there but it gives great value for its price and provides users with the basic features you expect from an help desk program. Olark has helped us increase our user to customer conversion rate and also halved our services churn rate. Simple, straightforward, and easy to use. They've had a few recent bumps but that's only demonstrated their support is great. PS: their cobrowsing tool is awesome. It's a screensharing app built-in to their app! Their pricing model is pretty wonky. You buy 1, 4, 8, or 16 seats. It was pretty frustrating to want to add 1-2 users, but not have to leave 2-3 slots open for the next 6 months just because of the model. Check out Olark and their competitors. They all, for the most part, have very similar basic attributes. But some will have better integrations that you may need, others will have something like cobrowsing for screensharing, and others might have something else that's super cool. Olark has an API you can connect to, too (I'm assuming all do, but I'm not sure). We are Support for our customers in the Financial Tech industry. We've realized that live chat is extremely efficient and customers love it. It's terrific to handle inquiries/questions while working on it rather than trying to hop on a phone call or use email. One point of clarification - we no longer offer cobrowsing. We do however offer link expansion in chats and file sharing, which make it possible to share screen capture with someone on chat. Hope that helps! "Olark was great for interacting with cusomers"
I really loved that with Olark we were able to use shortcuts. This made our response time wicked fast and error free! I didn't like that sometimes it wouldn't show me which of my colleagues were online all of the time. It was nice to know when I was free to leave Olark and when they needed me there. Be sure to know how you will respond to spam messages coming in ahead of time to have a streamlined workflow. "Olark - the king of chat!!" What don't I love about Olark? The easy to use software, amazing customer support and all around fantastic product make Olark easy to love and recommend! Honestly, Olark is one of the best products that I've ever used! Constant communication with customers! Olark chat makes it easy to keep your customers engaged in real time! When using Olark, we saw our customer satisfaction skyrocket! "Simple to use and perfect for quick on-boarding. " Olark is an outstanding live chat software that's perfect for an entry level customer service team. It's straight forward, has a great UX/UI/ and can be implemented in minutes. Honestly, nothing. The software is intuitive and the free trial lets you test out if it's a great fit for your organization. Even if you're curious, check out the free trial. It's excellent for for small and mid-sized businesses. Lightweight customer service in an entry level customer service environment. We increased conversion rates by a third after implementing Olark live chat. "Olark, very user friendly & cost effective platform"
The platform is feature rich and keeps you informed of who you're communicating with. There isn't much to dislike with the platform, but if I could change one thing, I'd add an app integration with my CRM so I don't have to have multiple browser tabs open. One for Olark & one for CRM. General customer support from their PC or mobile browsers. End users can communicate directly with support staff to have a plethora of issues resolved; including sales information. "Olark is a bare-minimum experience, but helpful in working with users"
It's simple. There is a low barrier to entry for new users. I wish it could do more in terms of sending content to the user, but it's reliable and it works. The content we can send is limited. It would be awesome to be able to send photos, GIFs and other content to the user. I also wish the chat bug was a bit smaller and/or we could push it around the screen depending on the page. Take full advantage of your own tutorials sites. Make bitly links and make shortcuts in Olark for faster chatting. I like Olark for communicating with users as they use our product live online. The benefit we get is we are able to head off problems before the user has to call or email us for help. "Simple, Easy to set up LIve Chat Service"
Olark is super simple to implement and get running with. Once you initially set up your preferences this is pretty plug and play and works as you would expect. Interface is wonderfully customization and the company n general is a delight to work with due to their fantastic customer support and documentation. The dislikes I have mainly stem from our organizations outgrowing of the platform. We are in desperate need of a queue which Olark does not have and I don't foresee them having for some time. They also do not have a robust API which would allow us to create custom dashboards and tap into data housed within Olark to display to our team. Uptime has also been lacking in the past 6 month. We rely on our live chat for our customer support and when customers are not able to get in to chat with us it's not a pretty sight. Olark is always very responsive and great about updating when they have an issue, sadly this has been more often than one would expect. And finally we have seen buggy issues with the way chat times are calculated resulting in statistics such as average chat time really worthless as chats do not close properly and thus it seems they continue forever. If you need a simple, delightful live chat feature for your site Olark is the right app for you. However if you need something more robust and able to handle a queue I would look elsewhere unless things change. We use Olark to handle our on site live chat in support of our SASS product. We joined it for integration with Sirportly, but found it fantastic easy to use, cuts down on support tickets and has a fantastic tracking and CRM integration. minor things like can't make it bigger on the user side, if they're sending us large amounts of text it fills up their page pretty quick and same with responses. making it hard to read - BUT, you can send them an email of the transcript showing everything so its a minor thing but it comes with a work around. it's great for giving the customer an instant update. Sometimes the chat can lag the correct page that the visitor is on. But other than that no complaints! Super easy to use! The integration with Salesforce has been so easy to push leads directly into my CRM! The ability to talk to potential new customers through the chat is great! I am able to answer questions for prospective customers, and identify those that are current customers! "Olark is a straightforward live chat solution"
I've enjoyed how easy it is to use Olark. It was simple to install on our website, easy to configure, and didn't take much time at all before we were live chatting with customers. Olark lacks a mobile solution and doesn't offer strong alternatives through third party integrations. An integration with Slack is available, but there are some glitches. Olark offers a handy guide that helps get you started. We initially began offering live chat to customers so that we could solve their issues a little faster. One benefit is that as I have been talking to our users in real time, I am able to assess the situation faster and offer suggestions which help to resolve their core problem. * We monitor all Olark reviews to prevent fraudulent reviews and keep review quality high. We do not post reviews by company employees or direct competitors. Validated reviews require the user to submit a screenshot of the product containing their user ID, in order to verify a user is an actual user of the product. Hi there! Are you looking to implement a solution like Olark?